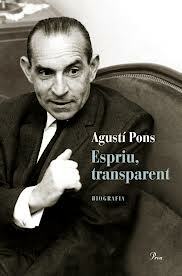 ​In this biography, Agustí Pons definitely puts Espriu next to the highest Catalan figures of all time. Pons opens the key to understanding a complex and ambitious literary work, which has dazzled critics as Harold Bloom, in which there is a cabalistic powerful presence, echoes of the Bible, Greek and Latin classics and some of the most important contemporary writers. The book also illustrates the continuous and discrete leadership of Espriu in the Catalan culture of the postwar period, small circles from the forties to the great cultural changes of the sixties and seventies. The biography provides information on changing relationships Espriu the most prominent writers of his time and avoids the controversy that accompanied its unique intellectual itinerary. Finally, Agustí Pons notes the fundamental contributions of Espriu when setting the field of Catalonia leaves the regime.